We are proud to announce that J.A. 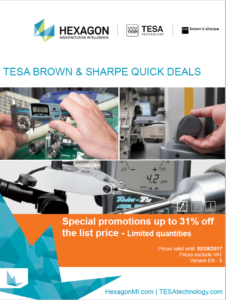 King is now a distributor for both the Tesa and Brown & Sharpe product lines from Hexagon! We are excited to offer even more high quality dimensional measurement product solutions to customers throughout our entire network of laboratories across the U.S.
Take a look at the latest product promotion from Hexagon for these two great product lines. Prices are valid until Feb. 28 2017. This entry was posted in Main, News & Events, Products. Bookmark the permalink.